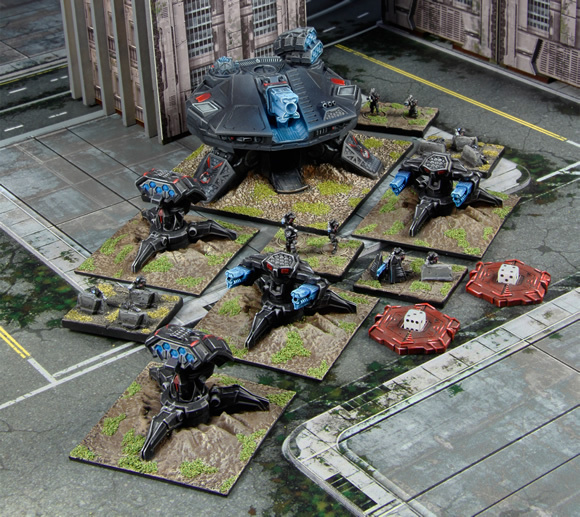 One of the most exciting product releases during 2015 for Firestorm Planetfall was the Ground Command Helixes, which were announced in late October ready for shipping this month. It has been an exciting and busy year for Planetfall with a myriad of models released, and the roll out of the Command vehicles underpins not only our commitment to our 10mm scale ground warfare game, but sets out our product roll out for this exciting game. “The idea of Ground Command Helixes is to anchor the existing Planetfall forces together, and set the scene for new Helixes. 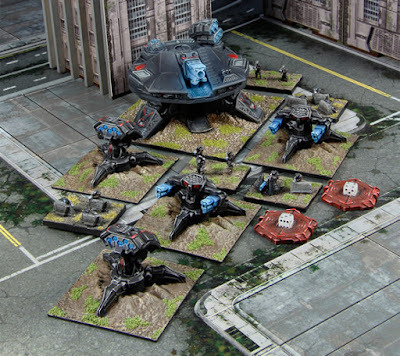 2016 is set to be a most cool year for ground warfare in the Firestorm Galaxy. We found our feet in 2015, delivered a raft of excellent models, made our rules free to anyone who wants to play them and set the bedrock for the future. I can’t give it all away in this blog, but folk are set for an exciting journey next year,” explains Spartan Derek, lead designer of Firestorm Planetfall. 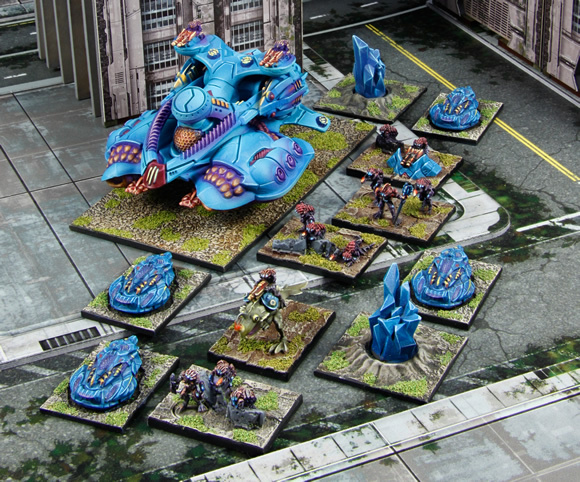 The Dindrenzi utilise many Sky Drop assets in a bid to disrupt their enemies. One of the most effective of these assets is the fearsome Charon Heavy Command Drop Pod which is used to concuss and disorient its enemies prior to the execution of its core responsibility – the delivery of some of the Federation’s most vicious and aggressive troops, the Nyx. Beyond its troop delivery role, the Charon also acts as a static Artillery Command, bringing in low-orbit artillery to be targeted at locations of high enemy resistance. The more capable Dindrenzi Commander will ensure the Charon is deployed in the right place at the right time to deliver total devastation to i enemies. Armed with a flexible spread of anti-armour and interceptor weapons, the Charon maintains a strong battlefield presence delivering its ordnance and artillery support with precision. The Nyx Light Infantry Cadres are the cutting edge to many Dindrenzi assaults. When massed together into a larger formation, such as a Grand Company, the Nyx can easily overwhelm their foes in close quarters battle. Designed specifically to carry the best Terran Ground Infantry right into the middle of the fighting, the Slepnir Heavy Command Vehicle is not built to stand at the back watching idly by as the rest of the Terran army engages. It is equipped with a massive amount of close quarter grenade pods, ensuring that no lightly armoured enemy should get too close. 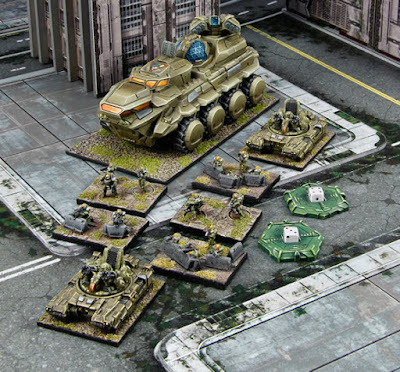 Even if these infantry were to keep a suitable safe distance, the Command Vehicle can engage its thrusters to close the gap with frightening speed, using its stabilised grenade pod mounts to deliver a knockout blow. The Slepnir’s greatest innovation comes in the form of a prototype Shield Harmonics Projector which can boost the power of nearby Terran Shields on other vehicles. This focused improvement is often taken over the more standard Shrike Rotor Weaponry as most Terran Commanders rely heavily on their defensibility when moving into position. Further to its close support capabilities, the Slepnir rains death upon the enemy with a dual Hammerstrike Missile system, ensuring the Slepnir Command Vehicle is a natural choice in most Terran Battle Groups. Well equipped with highly effective small arms and often fielded with specialists such as Raptor Grenade Launcher Field Gun Teams and close support Sweeper Teams, the Hirdmen are some of the most numerous and effective infantry in the Firestorm Galaxy. When fielded in a fearsome Grand Company, the Hirdmen are more than capable of overwhelming any enemy with a combination of numbers and dogged determination. The Malani Heavy Command Barge provides a flexible fire-bastion to any Aquan Forces it may be attached to. Armed with a fore-mounted Corona Heavy Laser battery, twin Maelstorm turret-mounts and a bank of Stingray missiles, the Command Barge is capable of independently targeting numerous targets, be they Armoured or Aerial. Malani to have an increased resonance with Votari Crystals deployed on the battlefield, their effects magnified by the Malani’s presence until they become capable of storing even greater levels of laser energy fired into them by the remainder of the Aquan force. As one of the most numerous surface-dwelling races that make up the forces of Aquan Prime it often falls to the Khitari infantry to prosecute Aquan interests on the battlefield. Well trained and well equipped, the Khitari engage their enemies with relish, trusting in their Shoal-mates and delivering the retribution of the Aquans into the heart of the enemy. When fielded as a Grand Company, the noble Khitari are often used to overwhelm stubborn resistance who have dug themselves in, using a combination of Maelstrom Pulse Cannons and vicious close quarters battle to achieve their victory on the battlefield. The Jol’Tak Command Skiff acts as a mobile command and control point for the powerful Ro’Mul’Kat Warchiefs who lead the hosts of the Sorylian Collective. With their Kul’Vok Bodyguards in close attendance these venerable warriors fight alongside their subjects on the fields of battle spurring them on with their own acts of valour and ferocity. The Skiff is fitted with an array of the most powerful Sorylian communication devices and a prototype New-Dawn Nexus Designator that greatly increases the effectiveness of Sorylian artillery barrages. This technology allows the Sorylians to deploy their artillery with pinpoint accuracy, leaving the other factions in the Firestorm Galaxy to quake in fear as the Sorylians hammer home their dominance in the field of pre-plotted heavy ordnance. In addition, the Skiff is armed with a powerful Nar’VaK Titan Cannon and a brace of Sar’Nav Grenade Launchers, perfect for softening up a target prior to an assault by its transported infantry assets. Kul’Vok Heavy Infantry into battle atop their massive command barges, charging directly into the heat of battle. The nature of the Directorate is exemplified by the Assailant’s core function – Cyber Attack. The vehicle is highly capable when deploying its Cyber Weapons, boosting both itself and nearby elements who engage the enemy in a similar way. That is not to say the Assailant does not have direct action weaponry, commonly fielded with a fore-mounted linked Plasma Surge that ensures the vehicle it is utterly devastating when targeting enemies at short range. In addition, Directorate low-orbit artillery barrages are directed using a pair of Punisher Drones that are launched from the hull. These diminutive Drones can also act as target designators for their parent, further supplementing the vehicle’s heavy firepower. Finally, the Assailant houses a close support unit of Deadlock Heavy Infantry who are banded together into a Grand Company, their engagement protocols set to execute close range targets with their own brutal combination of Cyber and close ranged attacks. The infamous Deadlock Heavy Infantry Cadres are the faceless killers of the Directorate forces. Crewed by a lobotomised vat-bred amalgam of circuitry and advanced genetech, the Deadlocks are without pity, remorse or compunction. Armed with TS-Scrambler Weapons, they can be relied upon to deliver strong alpha-strike attacks into the heart of enemy formations where their ability to debilitate their foes should not be underestimated. Slamming into the ground at high-speed, the Javi Command Spire is designed to instantly intimidate all enemies of the Relthozan Empire, its impact shockwaves signalling the arrival of this devastating war machine on the battlefield. 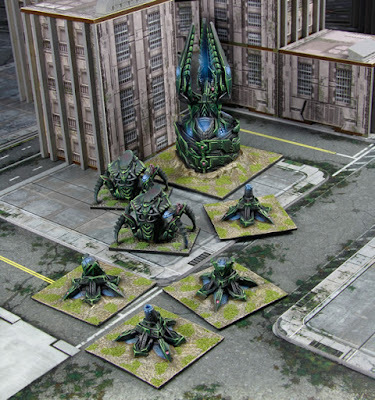 The massive spire acts as a core command point for Relthozan forces, providing support to both light and armoured forces in equal measure with extended Drone Nexus and Command effects. 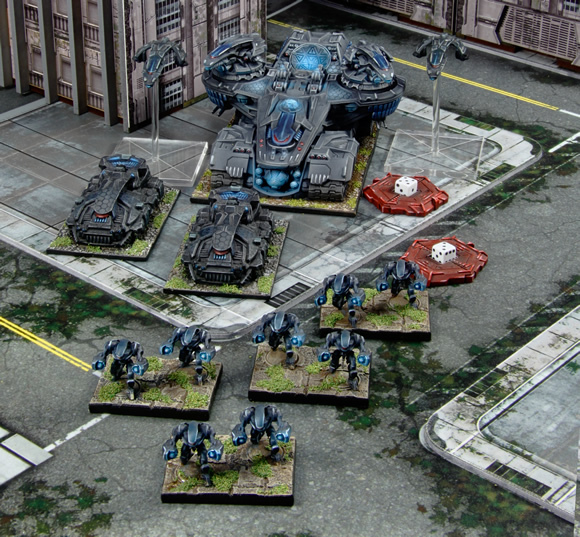 Once deployed from low orbit, the Javi expels a number of Narissa Gunnery Nodes to act as close defence and fire support. These nodes are outfitted literally as the Command Spire hurtles towards its target point on the battlefield and are considered to be highly flexible gunnery positions, despite their lack of manoeuvrability. Finally, the Javi will release its bonded Salamas Bodyguards who are tasked with the Command Spire’s defence. Heavily armed and highly aggressive, these warriors will fight to the last breath to protect their primary Commander on the field. Expelled by the Javi Command Sire, Narissa Gunnery Nodes are armed with one of two weapon types: Spinneret Launchers are particularly suited for engaging aerial targets, scanning the skies, ready to strike, whereas Chelicerae Missiles are often deployed against dug in enemies forces where their Corrosive Barrage weapons can concuss and debilitate the enemy prior to a concerted Relthozan swarm-attack. As to the future, we’ve still got the Assault Helixes, Close Combat Leviathan and expanded Infantry Helixes to come. These three Helixes will deliver even more flexibility to a game that is already expanding for gamers. But we won’t stop there. Once the core 6 races have been assembled we will start adding Alliance races at a pace of knots. 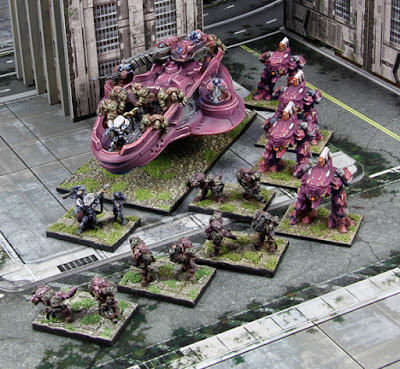 This will see some Alliances gain their first Helixes, whilst others will gain a major momentum, allowing players to actually field an entire fighting force based around their favourite Alliance race. Note: The above images do not show the full contents of the Ground Command Helixes, rather they show the key unit types. See our online store for a breakdown of the full contents for each Helix.